Tired of the constant shaving, plucking and waxing of unwanted hair? The best solution is Laser Hair removal. Laser hair removal is the most desired hair removal method because it is fast, safe, convenient, and virtually pain-free. Laser Hair Removal targets the colour in the hair follicle. Normal hair growth goes through numerous stages – anagen (growth), catagen (resting) and telogen (dormant or shedding) stage. The laser picks up the colour of the hair and heats it to kill it (in the active anagen or growing phase only). For this reason, multiple treatments are necessary for hair removal because not all hair is in the same phase at the same time. The Award Winning Soprano ICE Laser Hair Removal system is an all-in-one laser system that can be safely used on any skin type, without the discomfort of more traditional technology. Together with a high repetition rate of short heat pulses that sweep over the hair follicles, combined with the instant cooling application for increased comfort, this system reaches well beyond traditional lasers on the market today. 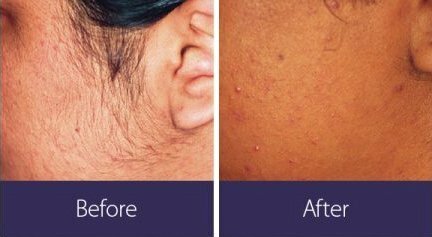 Additionally, this system has revolutionized medical photo epilation, leaving you with more long lasting, satisfactory results. It also means little to no discomfort for you. Laserlicious Medical Spa offers a variety of treatments for our clients, but the one we are most known for and specialize in is Laser Hair Removal, with hundreds of happy clients our qualified team of Medical Aestheticians understand skin types, the importance of timing during and in between treatments and hair growth to provide the best results. We truly believe that being honest and handling our client’s expectations is a significant part of our job. Virtually any part of the body is a possibility. From legs, back, shoulders, neck and arms to more sensitive areas like the derriere, bikini line, and even the inner part of the buttocks. During a treatment only one section at a time is treated and the rest is covered, maintaining your privacy during the laser hair removal. Your comfort, safety, and results matter more than anything. Laserlicious’s Soprano ICE technology prioritizes all three. So if you’re looking for a laser removal system that puts both the comfort and satisfaction of clients at the forefront, then this is the laser hair removal treatment for you. The revolutionized and cutting edge technology makes each treatment quicker, virtually pain – free and easy. We would love to speak with you. Whether you’ve made up your mind or not on starting your journey with us, we are happy to answer any and all of your questions. Feel free to contact us, or come on in for a complimentary consultation and patch test and speak with our laser hair removal specialist today. Laser Hair Removal Can Be With The Soprano Ice. At Laserlicious We Offer Package Pricing For All Body Areas! Packages can be purchased in sessions of 3 or 6, the more you buy the more you save! Visit or call us to find out More Information! We recently had Michael Rizzi, a Toronto based Vlogger come in for Laser Hair Removal. Check out his video for his experience with us and about getting Laser Hair Removal.